This post is a first for my little blog -- a book review and a giveaway! 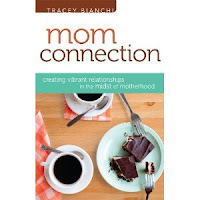 I was given copies of the book Mom Connection: Creating Vibrant Relationships in the Midst of Motherhood by Tracey Bianchi to review and giveaway (see below for more details). Its the theme book for MOPS this coming year (2012-2013). Tracey Bianchi successfully gives advice like a friend, honestly sharing what's on her heart, and truly understanding that some days motherhood can be lonely. She shares great information about life rhythms, relationships, and remembering that the need for connecting with those around you (and the world) doesn't disappear when you become a mom. I appreciated Tracey's honesty about how hard it can be to connect with other moms, especially beyond the "hi, how is it going?" level and the need to be intentional about those connections in order to build friendships you can rely on. For me, MOPS was a big help this year when it came to meeting other moms in the community, but I could have been a bit more courageous. Too often I thought, "Oh they are already busy..." or "I don't know them well enough to ....". Really I was just nervous. I enjoyed this book and I love that I get to share it with someone! I have ONE copy of this book to giveaway. To enter the giveaway, fill out the entry form below. If for some reason that isn't working, feel free to email me (LifeOnGravellyRoad at hotmail dot com). The giveaway will end Monday May 14th at 11:59pm. A winner will be drawn on sometime on Tuesday May 15th and announced on this blog. * Disclosure - I was given free books to complete this review. My opinions are my own.